BenQ is derived from ‘Bringing Enjoyment N Quality to Life’, and this is exactly what they wish to achieve in their line of monitors. The brand vows to continuously touch the areas where they can influence or improve their user’s enjoyment and quality of life. The BenQ GL2450HM LCD monitor aims to bring out a perfect platform for viewing documents, computing purposes, and Internet browsing. 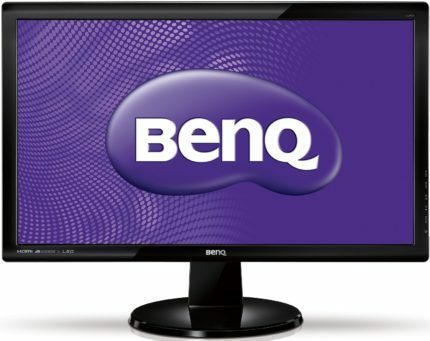 Let’s begin this BenQ GL2450HM PC monitor review by taking a quick glance at what this monitor has to offer. Its general features include the color contrast ratio of 12M:1, response time of 2ms, and built-in speakers. This 24” LED monitor may seem basic for many. However, when it comes to providing audiovisual enjoyment, it can certainly deliver the goods. It was quite easy to label this BenQ GL2450HM 1080p screen as a top favorite among basic 24-inch LED monitors available on the market today. For general computing and video streaming, this is a good option. It’s a decent monitor that can be used even for long periods of time. As it has an integrated technology that eliminates flickering, your eyes will not feel tired even after using it for hours. Although it lacks the rich and intense colors of the more expensive type of gaming monitors, this BenQ GL2450HM is certainly good enough for general computing purposes as it comes with a dynamic contrast ratio of 12M:1. In simpler terms, this ratio adds definition and color depth to complex as well as darkened motion pictures. This provides a clear and smooth picture performance for both video games and movies. At prolonged use, you may notice that the blacks go slightly muted. However, it still performs better than most inexpensive brands and models of monitors today. While it may not be as expensive as many other monitors available to date, this monitor remains a good option and its integrated Flicker-Free Technology is one reason you should give this model a try. As opposed to conventional LCD panels, this 24” LED monitor does not produce any flickering at any brightness level. Although you do not really see it, LCD panels flick about 200 times every second. This is one helpful feature as flickering add strain to your eyes. The 24” display of the BenQ GL2450HM is technically a TN-based LCD-type one. It is the most basic type of LCD panels. This also means that it does not possess a rich contrast ratio that you would typically find in the VA-based gaming or computing monitors around. Another distinct difference between the display quality of this monitor and the In-Plane Switching type apart from the color quality is the consistency of quality in wide-viewing angles. While TN-based panels may not have as good image quality other panels, they do deliver the fastest response time which is particularly praised in fast-paced gaming. The LCD monitor of the BenQ GL2450HM TN monitor is equipped with LED backlighting which offers massive advantages over the LCD monitors with integrated CCFL technology. LED offers the upper hand when it comes to several performance metrics such as high dynamic contrast and the absence of light leakage. LED backlit monitors are also built with environmental considerations in mind. Both the manufacturing process and the disposal methods are performed with minimal pollutants. This monitor is also designed to be absolutely flicker-free. In fact, it has been the first brand to receive the TUV Rheinland Certification for its unique Flicker-Free Technology. The absence of flickering boosts enjoyable viewing experience and reduces eye fatigue. One important feature that is worth highlighting in this BenQ GL2450HM monitor review is the built-in platform that boosts enjoyable audiovisual experience. Yes, speakers! While it may lack in other departments, this model certainly makes up for it by providing crisp and enjoyable sound. You get to experience the truest color range with the use of the calibration techniques via te Senseye Technology. The pre-set viewing modes are Standard, Game, Movie, Photo, Eco, and sRGB. Of course, ECO mode offers eco-efficient viewing option. Concerning the ergonomics of the BenQ GL2450HM display, it is VESA mount compatible and can be tilted by around 25 degrees. This monitor is built with the latest HDMI multimedia interface besides the standard VGA and DVI ports. This makes it compatible with any type of multimedia equipment that you may wish to connect. The connectors can be plugged in vertically, which offers a much tidier appearance from the rear end. 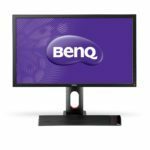 The BenQ GL2450HM price is $188 at the moment (May 2017). If you’re looking for an inexpensive yet reliable monitor with a crisp Full HD 1080p resolution which you can also use for some fast-paced competitive gaming thanks to the quick 2ms response time, the BenQ GL2450HM delivers it all. The screen size of 24 inches, the fast response time, and its solid but certainly makes it one of the monitors that offer good value for money. The color resolution and the detail resolution are sufficient to provide you an enjoyable streaming and gaming experience. This monitor has likewise obtained Windows8 certification and is completely compatible with the color systems of Windows8. For new gamers or the budget-conscious users, this is certainly a good buy. The BenQ GL2450HM is more than just about affordability. It has the features that every user and budding gamer needs. On top of the LED Backlight and certifications obtained, users can benefit from its range of features. From the flicker-free technology, Senseye Technology, and the AudioVisual features, this is one model to try.